Capturing the cool, green light of the rainforest, accommodation is in secluded forest huts nestled in the rainforest canopy. A minimalist design maximises the sights, sounds and smells of the rainforest whilst giving some personal space to those creatures you may prefer not to sleep with. Accessed by a boardwalk to protect the forest floor, the rainforest huts have no solid walls, instead the timber structure is screened on all four sides with weather proof curtains able to be drawn for privacy and protection from adverse weather. 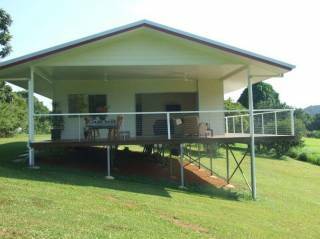 Each hut has a small verandah, simple furnishings and sleeps two in either double or twin occupancy. Of solid wooden construction, with ample, screened glass windows, the canopy cabins offer maximum protection from the elements, while still offering a close connection to the sights and sounds of the forest. Larger than the rainforest huts, these cabins are stylishly appointed with polished wooden floors, handmade natural timber furniture and spectacular glass-walled bathrooms looking out high in the trees. With a studio-style lounge and bedroom and a private, furnished verandah, the canopy cabins offer superior accommodation in an entirely natural environment. Of solid wooden construction, with ample, screened glass windows, the canopy cabins offer maximum protection from the elements, while still offering a close connection to the sights and sounds of the forest. Larger than the rainforest huts, these cabins are stylishly appointed with polished wooden floors, handmade natural timber furniture and spectacular glass-walled bathrooms looking out high in the trees. 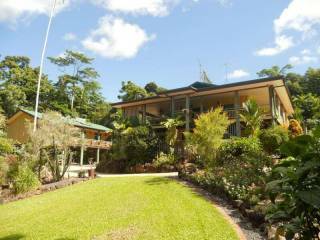 Sanctuary Retreat is an affordable accredited eco-tourism rainforest sanctuary at Mission Beach, North Queensland, half way between Townsville and Cairns. Set on over 50 acres of lush tropical rainforest overlooking the Coral Sea, Sanctuary is as much a refuge for travellers as it is for wildlife. Designed to minimally impact on the outstanding natural values of the environment, Sanctuary offers guests an intimate, yet comfortable rainforest experience in a unique setting. Sitting high on a hill to catch the cooling breezes and views across the forest to the Coral Sea beyond, the Sanctuary Long House Restaurant and Bar captures the essence of the tropics. Polished hardwood floors, high ceilings with fans lazily shifting the balmy air and a balcony situated perfectly to watch the sunrise heralded by a dawn chorus or a full moon appear out of the sea at sunset. Accommodation is in either secluded forest huts or deluxe canopy cabins nestled under the rainforest canopy. Sanctuary offers guests a unique insight into the ecology of a tropical rainforest along with the knowledge that by staying at Sanctuary, they are contributing to the conservation of plants and animals found nowhere else on earth. Credit Card details are only required to secure your booking. Full payment is processed upon arrival via your preferred payment method. Last check in is at 9pm. Cancellations or modifications are free if made more than 3 days from the booked day of arrival. One night's cancellation fee shall apply if the booking is cancelled less than 72 hours prior to the arrival date. Date changes are subject to availability. To help ensure the serenity of Sanctuary is preserved, no private vehicles are allowed beyond the carpark. The Sanctuary 4WD vehicle transports guests on arrival with their luggage from the car park to the main building between 8am and 9 pm. Please note that the latest arrival time must be before 9.00pm.